First Outing for Proud's "Prime Minister"
From L to R, Jordan Pettle, Michael Healey, and Jenny Young, reading Healey's Proud. “Welcome to Theatre Passe Muraille, a Toronto home for provocative discussion.” This was Passe Muraille’s artistic director Andy McKim’s opening remark to a packed house on Monday night, there for a reading of Michael Healey’s controversial play, Proud. Nearly every theatre makes that claim, of course, but the words were particularly weighted, considering the script we were about to hear. First, some context: Passe Muraille is in a tight spot right now. Dancing With Mary, their anticipated one-woman show, featuring Mary Walsh (founding member of Codco and This Hour Has 22 Minutes), was delayed and eventually cancelled due to Walsh’s unfortunate recent hospitalization. 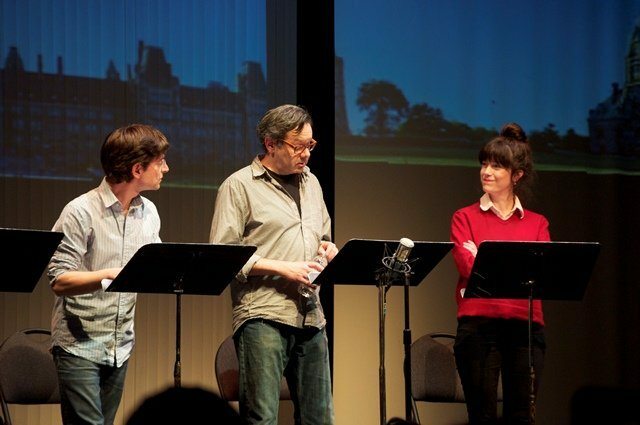 The show’s cancellation created a nearly $60,000 shortfall for Passe Muraille (their insurance won’t cover the loss of their only leading lady), so McKim reached out to playwright and actor Michael Healey and suggested he present a reading of Proud as part of their fundraising efforts. We obviously won’t be writing a full review this early in the show’s development, but as far as legal questions go, we couldn’t see that there is a clear case to be made that the script libels Stephen Harper. 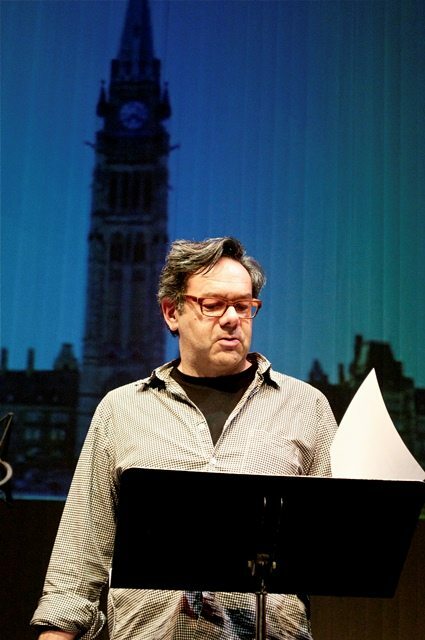 While the main character in Proud is unmistakably modeled on Harper, he’s never named as such, instead addressed as “Prime Minister” throughout the play. In an epilogue, Harper is mentioned by name, but the characters in the play in turn are not. So while it’s clear who Healey has been inspired by, he never actually identifies the character as Harper. As for the content of the play, it’s very much comedic; a look at the “strategies and tactics” of a politically shrewd puppet master, filled with rapid-fire dialogue—not unlike the West Wing. The Prime Minister of Proud (read by Healey on Monday night) is a sympathetic character at heart; one who, behind all his ruthless machinations and manipulations of the parliamentary system, the media, and the Canadian public, is a decent, intelligent, intensely committed man with very reasonable goals. It’s just that he and his party will do all sorts of underhanded and morally bankrupt things in order to further those goals. Toronto Star theatre critic Richard Ouzounian, in an op-ed earlier this week, emphasized that successful theatre needs to connect to the community by telling stories people connect with. The story of Stephen Harper and his secrecy-obsessed government is just that kind of story, and Healey’s script creates just that kind of connection. Photos by Amanda Lynne Ballard.